The Sir Bobby Robson Celebrity Golf Classic has been run annually for ten years at the request of Lady Elsie Robson and her family. The tournament was started by Sir Bobby in 2004 with the objective of having a fun celebrity golf tournament in the sun, but most importantly to raise money for a homeless children’s charity the Refugio Aboim Ascensão, chosen by Sir Bobby and Lady Elsie, which is based in Faro. Secondly, because Sir Bobby would have wanted to keep raising valuable funds for the Charity and help those Children so less fortunate than our own. Celebrities from the world’s of football, sport and entertainment attend and play with the corporate teams for the honour of winning Bobby’s tournament played on the Championship Course at Pestana Vila Sol on the Algarve, which has twice hosted the Portuguese Open. Celebrities who have played include Steve Bruce, Mick McCarthy, Alan Shearer, Kenny Dalglish, Alan Brazil, Harry Redknapp and Sam Allardyce to name just a few. 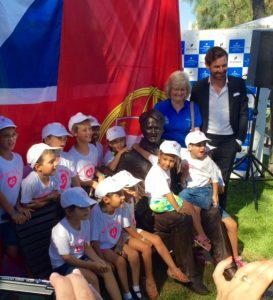 In 2016 a wonderful statue of Sir Bobby was commissioned and placed in a beautiful position, sitting on a bench overlooking the 18th green at Pestana Vila Sol. This was out of respect for the considerable efforts and sums raised for the Refugio. A lasting legacy. In June 2018 a room at the Pestana Vila Sol Golf Club was named after Sir Bobby. The Sir Bobby Robson lounge is lovingly decorated with pictures and memorabilia from Sir Bobby`s career and there is a dedicated wall to the Refugio. This is a must see room on any visit to the Pestana Vila Sol Golf Club.